A mysterious signal has been seen in X-ray data from a study of over 70 galaxy clusters with Chandra and XMM-Newton. This spike of intensity at a specific wavelength of X-ray light has several intriguing explanations. More data and investigation will be needed to confirm both the signal's existence and nature. 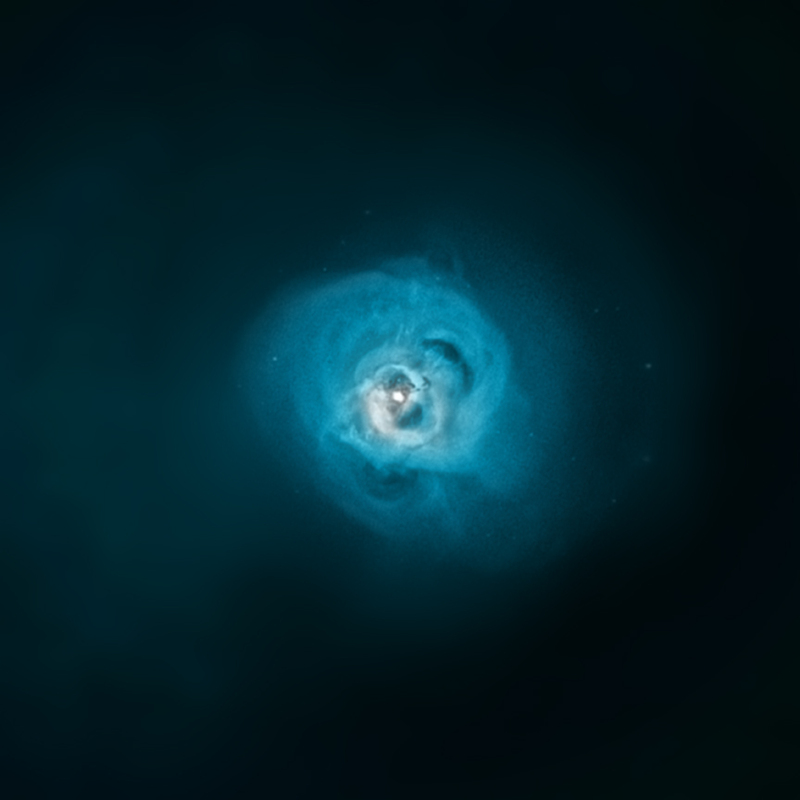 This image shows a new view of the Perseus cluster, one of the galaxy clusters included in the new study. 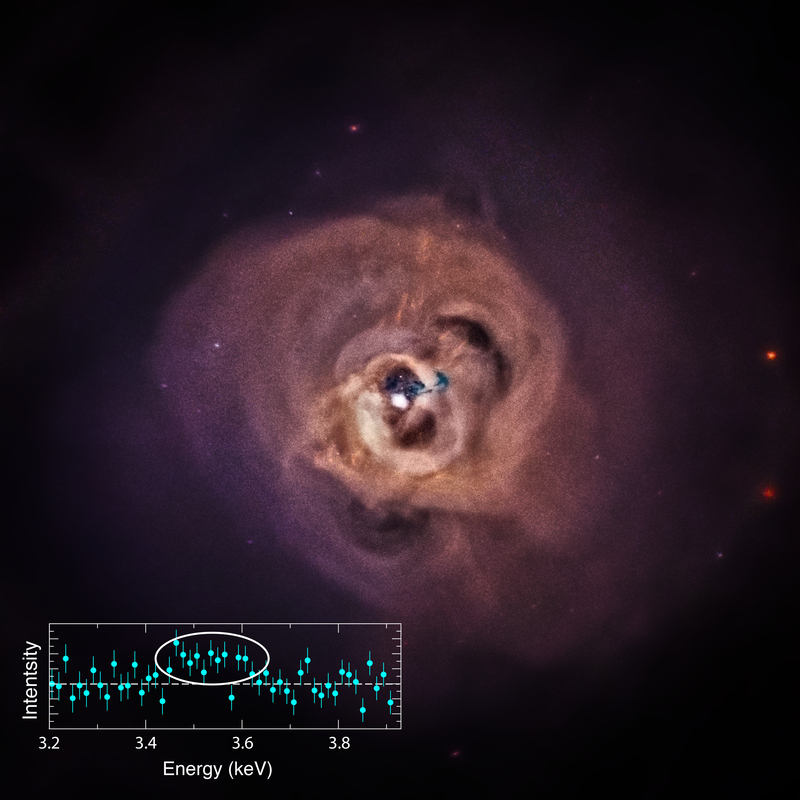 A new study of the central region of the Perseus galaxy cluster, shown in this image, using NASA's Chandra X-ray Observatory and 73 other clusters with ESA's XMM-Newton has revealed a mysterious X-ray signal in the data. This signal is represented in the circled data points in the inset, which is a plot of X-ray intensity as a function of X-ray energy. The signal is also seen in over 70 other galaxy clusters using XMM-Newton. This unidentified X-ray emission line - that is, a spike of intensity at a very specific energy, in this case centered on about 3.56 kiloelectron volts (keV) - requires further investigation to confirm both the signal's existence and nature as described in the latest Chandra press release. This image is Chandra's latest view of hot gas in the central region of the Perseus Cluster, where red, green, and blue show low, medium, and high-energy X-rays respectively. It combines data equivalent to more than 17 days worth of observing time taken over a decade with Chandra. The Perseus Cluster is one of the most massive objects in the Universe, and contains thousands of galaxies immersed in an enormous cloud of superheated gas. 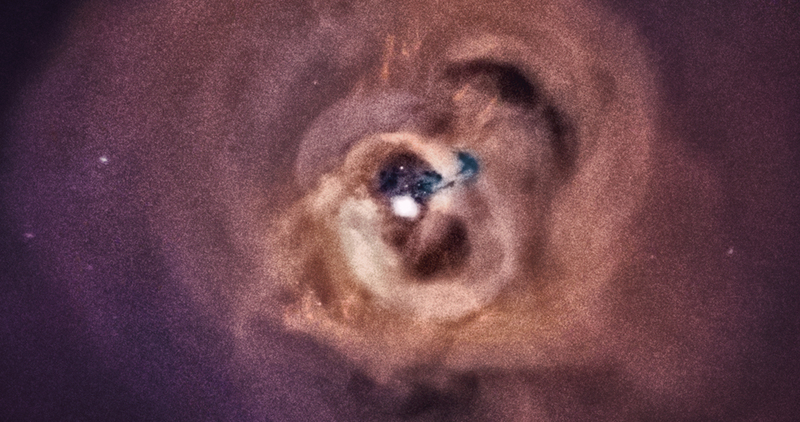 In Chandra's X-ray image, enormous bright loops, ripples, and jet-like streaks throughout the cluster can be seen. The dark blue filaments in the center are likely due to a galaxy that has been torn apart and is falling into NGC 1275 (a.k.a. Perseus A), the giant galaxy that lies at the center of the cluster. A different view of Perseus, shown below, combines data from Chandra in the inner regions of the cluster and XMM data in regions further out. A paper describing the detection of this mysterious emission line was published in the July 1st issue of The Astrophysical Journal and a preprint is available online. The first author is Esra Bulbul of Harvard-Smithsonian Center for Astrophysics (CfA) in Cambridge, MA, and NASA's Goddard Space Flight Center (GSFC) in Greenbelt, MD. The co-authors are Maxim Markevitch from GSFC, Adam Foster and Randall Smith from CfA, Michael Loewenstein from University of Maryland in College Park MD and GSFC, and Scott W. Randall from CfA. Credit X-ray: NASA/CXC/SAO/E.Bulbul, et al. Coordinates (J2000) RA 03h 19m 47.60s | Dec +41° 30´ 37"
Observation Time 416 hours 32 min (17 days 8 hours 32 min). About 250 million light years. About 768,000 light years across. In the constellation Perseus (Northern Hemisphere). Blog: A Flash in the Dark!